The Ston'emm from Bah'glenn Creations has been redesigned! 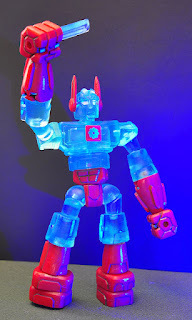 The good news is that they now feature light-up eyes, and several new color variants are on their blog showing off the Inhumanoids-esque deco. Check 'em out! These guys will make their debut at New York Comic Con, so be sure to check 'em out when you're there or keep watching the Bah'glenn Creations Blog for news on how to get yours. 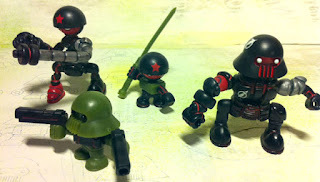 The Banimon blog updated with a figure schematic showing some of the builds and some of the pieces. With a target price of $7, you get 2 heads and a whole mess of weapons with each figure. "As promised, here are some schematics of the new toy. This does not show all the views, nor is it an indication of all the pieces that go inside the bag, it was meant more to illustrate few of the more obvious weapons building capabilities." He writes more, but you should go read it there. 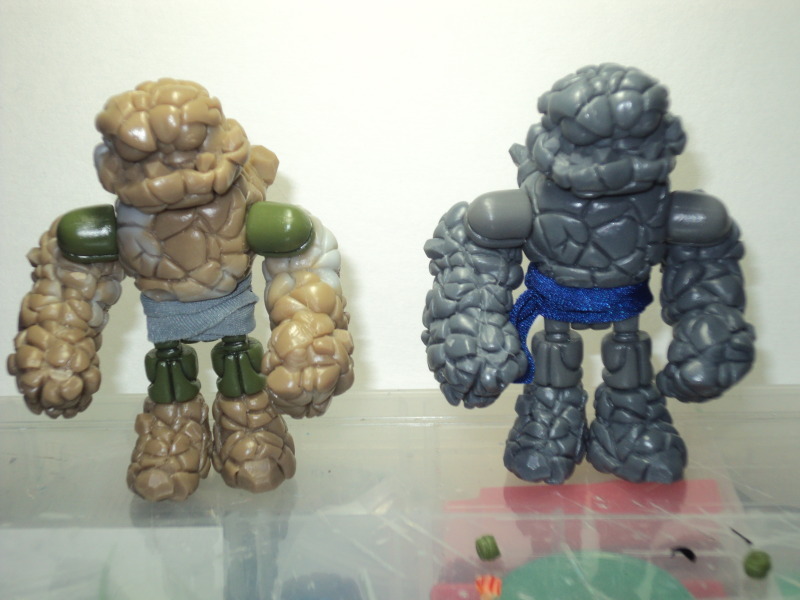 New at Onell Design, a sneak preview involving teases of Banimon (right) and Weaponeers of Monkaa (left). 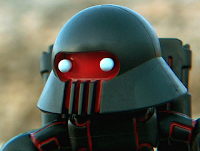 On the right, you can see a colorway of a swell figure in the red and black "Apocalypse" deco, which has an awesome paint job and looks a little Darth Vader-esque. I love it. To the left... I don't know what the hell that is. Anyone? I'm guessing it's a knee or a leg. Just a hunch. The Spy Monkey Creations Weaponeers of Mokaa are kept under a tight veil of secrecy, so I can only assume it's awesome. Go here and look at the whole post. And hopefully we shall see even more! They're here! The second and third Armorvor were joined by Hades Pheyden and a bunch of other swell stuff, depending on what you ordered. This time around, Onell Design included a bonus packet whose contents vary slightly from person to person. Each one includes a black or glow-in-the-dark unpainted Govurom head, a black scarf, 4 black pegs, and 2 glow-in-the-dark pegs. 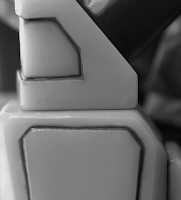 The pegs are used to fasten two Glyos sockets together, so it might help you out with your custom builds. As the main way to get these previously were by swiping them out of your Spy Monkey Creations weapon sets or out of a Glyan torso, it's nice to see some individually as well! 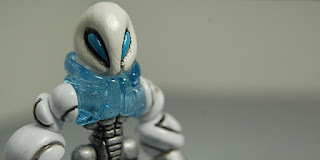 Banimon Update: New Pics, Color Confirmations! 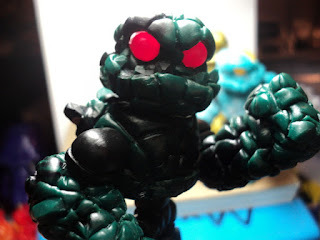 The Planet Banimon Blog has been updated with some more tidbits on the upcoming release of these new Glyos-compatible figures. "So it's going to be two colorways total, the green you see here (exact match with the Task Force Volkriun green), plus the previously announced Apocalypse colorway. Each figure will be sold separately and have both heads and all the weapons included, so basically the contents of the entire mold. Exact launch date and details to follow....."
Is it time to start getting excited? I do believe it is. Each figure has guns, swords, and a Darth Vader-esque alternate head, so what's not to love? 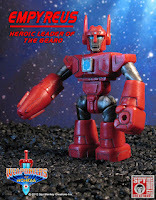 For reference, this hit just before the 5th anniversary of Glyos a couple of months back. 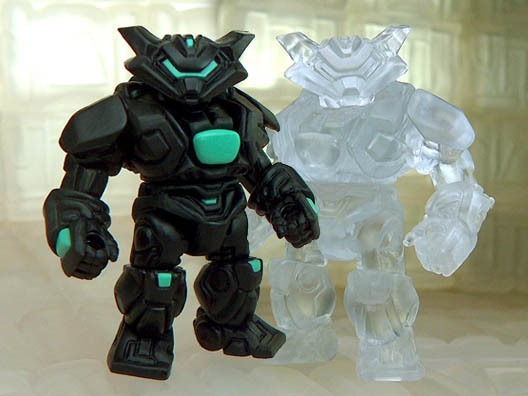 "The [next Glyos] assortment planned for October consists of three all new styles of Armorvor as well as few small surprises and that's it. Late November will see a larger drop which will close out the year, with the next scheduled release taking place sometime in January 2013." Whoa! Three more Armorvors, already? Spoiled rotten, we are. He also made mention of a higher run (hooray!) and a lower limit, reduced to 2 per customer. Which, honestly, makes good sense, and I have to say I'm glad he didn't also raise the price at the same time since the demand is clearly slaughtering supply right now. 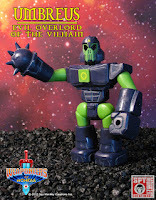 As always, the Glyos September 5, 2012 Hades Drop Menu is that big strip of images on the left. You can see a lot of stuff sold out really, really fast. If nothing else, it's a good sign that despite being a small company, Onell Design really knows how to market its stuff to potential buyers. Anyway, take a look at a menu to see what you missed! 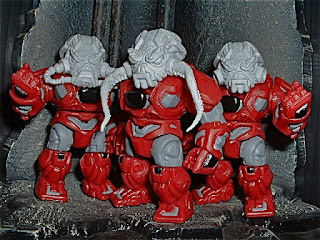 Glyos Drop Live! New Game "Glyhunter" Live Too! 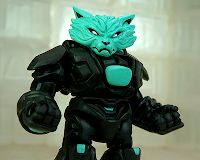 Glyhunter, which is like Spy Hunter (but not) joined tonight's drop of several new black-and-greenish figures. The new figures are up right now, and as always we'll post a menu of tonight's selections in a little bit. Go here to try the game Glyhunter right now! To see what's left at the store, click here. Black Hades Mimic Armorvor and Hades Pheyden figures sold out in under 8 minutes! The clear colorless Armorvor and several other items were gone within 15 minutes. Previously known for his super-cool Canne'boids, the Bah'glenn has revealed its next rocky creation called the Ston'emm! With help of Jeremy of Spy Monkey Creations, this hand-cast limited run will kick off at New York Comic Con and additional figures will be sold after the show. For more, check out Bah'glenn Creations. "The figures will be about 4"- 4.5" depending on the character. Most of them, Pheyden comes up to about their shoulder. They are bulky and chunky. Think along the lines of a Gobon for heft. 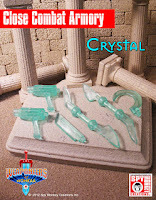 Each figure with accessories is gonna round out somewhere between 25-30 Glyos compatible pieces. All PVC no vinyl..... yet." Hey, not bad! They're teasing more with "The Stranger's Tale" story, but well, what will it look like? Will it be fun? 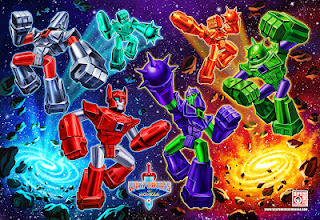 Are they going to be sized similarly to 1980s He-Man figures? I guess we'll find out later! 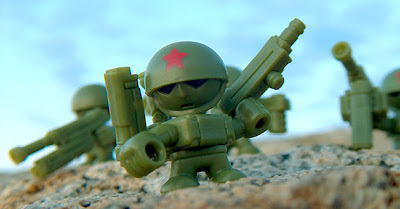 While not explicitly defined as Glyos in the new post Who are the Weaponeers of Monkaa?, Spy Monkey Creations has something new on its hands that will be revealed bit by bit over the next month. Some forum postings have indicated this may include full-size action figures which may or may not sport Glyos parts, so we're going to go ahead and tease it here too. 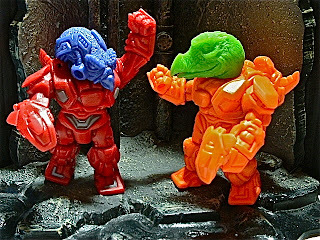 If it's Glyos, expect lots more posts just like this one! And if not... we'll update this post accordingly! 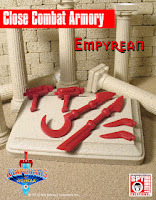 Either way, Spy Monkey Creations has made nifty Glyos-compatible parts packs as well as weapons scaled for Masters of the Universe Classics over the years and if you aren't already familiar with their wares, you should take a look.